(Scotiabank Field at Nat Bailey Stadium - Vancouver, BC) - When Andrew Von Rosen heard the word 'sold' at the 2nd Annual Scotiabank Vancouver Canadians Baseball Foundation Hot Stove Luncheon back in February, he knew he was about to get the experience of a lifetime. 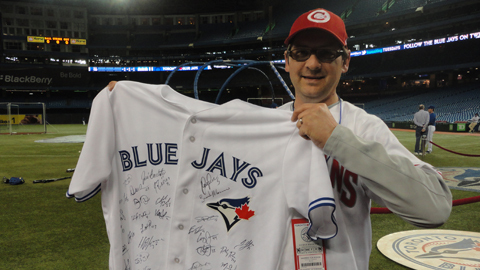 "Without question that was one of the highlights," says Andrew who is a lifelong baseball fan. The next night the Blue Jays fell behind 5-0 early before Toronto fought back with Lawrie's heroics capping off a 7-6 victory. Andrew's final day saw Rogers Centre open up the roof to reveal piercing sunshine and an offensive explosion for the Jays and they topped the Rangers 11-5 to take the three-game series. "To get to see the dome both open and closed was great. It is like two completely different stadiums". The total package included flight, accommodation, tickets to all three games vs. Texas, dinner at the VIP Club and a team autographed Blue Jays jersey along with all the 'behind the scene' elements which included a viewing of the 1992 and 1993 World Series trophies. Andrew's hotel room overlooked the field at Rogers Centre while one of his highlights was getting a tour of the Canadian Broadcasting Corporation's National Headquarters just steps away from Rogers Centre.